Our hosts woke up at 6am, made breakfast, packed up fruits and cake for us to take on the road… we continued to sleep on the bus and arrived at Xiahe by noon. This city is home to one of the main Buddhist monastery, the Labrang Monastery (if anyone remembers, we also went to one of the important ones in Xining), and pretty much the whole city revolves around it and the tourists it brings. We found a neat little hotel and got a room which overlooks the Labrang monastery. One particular feature of this monastery is the fact that it is surrounded by 3km of prayer wheels. The small ones you turn once, while the larger ones you turn 7 times. A continuous stream of locals make their way around the monastery constantly all day. The most devoted ones would do the full body prayer, where you’d walk a step, and then kneel down and proceed to lean forward with your hands until your forehead touches the ground. Every step. 3 kilometers. Some people are so frail they can barely walk, and a lot of these old ladies have backs severely hurt and walk with a 60degree hunch….. but they still continue to do it…. Note: It is a very common for Tibetan people to “round” things, like walk around the monastery, walk around a stupa (white tower), even walking around mountains!!! We walked around the town and surprisingly there was an “American owned, Peruvian breakfast, Mexican food.”. Pretty awkward set of combinations, but we went and had some good french toast!! They even have syrup!!!!!!! I’m beginning to miss 鬼佬 food. The night was spent watching Olympics! The ceiling of this restaurant is decorated with Fanta (soft drink) labels! It works! One of many halls, very nice. After a simple breakfast in the courtyard, we hopped on a speedboat to a dinosaur excavation site, home to the one and only, LANZHOUSAURUS. It sounds made up but it’s not! It is a recently discovered species found close to Lanzhou, hence the name. We headed back into the city and did some regular people stuff like: pick peaches the size of a grapefruit, eat hotpot, and get a haircut. Before arriving in Gansu, my impression was also that of Dunhuang, the patch of green surrounded by the Gobi desert. In reality, there is an abundance of fruits and vegetables, and due to the climate these fruits and vegetables beat Canadian fruits by a LONG mile. It’s not even close…. the fruits are soooo good! Even the potatoes here are better because they have less rain, so somehow it tastes more ‘solid’. We wrapped up the city view with a visit to the night market, and tasted a lot of foods not really found anywhere else. Lanzhou is pretty cool! And thanks to our hosts in Lanzhou who treated me better than my mother would have!!! Waking up without a hangover, we watched a bit of the replay of the Olympic opening ceremony, which was pretty darn cool. I didn’t really know what London could use as their theme, but the industrial revolution seems extremely apt, considering that’s pretty much where the source of modern society is born out of. In the afternoon, we took a 4.5hr ferry along the Yangtze to another cave complex with 1600 year old buddhist sculptures carved out of rock…. amazing! The ferry was pretty long, but we came prepared with cards, fruits and lots of snacks to snack on! Once we arrived at the destination of BingLing Temple (炳灵寺)。The surrounding scenery was also extremely impressive, with impressive high-rise rocks surrounding the whole valley. Really cool scenery! Taking the same ferry (downstream this time, so only took 3.5hrs) back to the docks, we had dinner and drank same baijiu made with a wheat product (青稞) only produced in high-altitude areas. No TV in our hostel tonight, so we sleep early and see some more of the surroundings tomorrow! We were picked up in the train station by our extended family and had an authentic bowl of Lanzhou beef noodle soup! 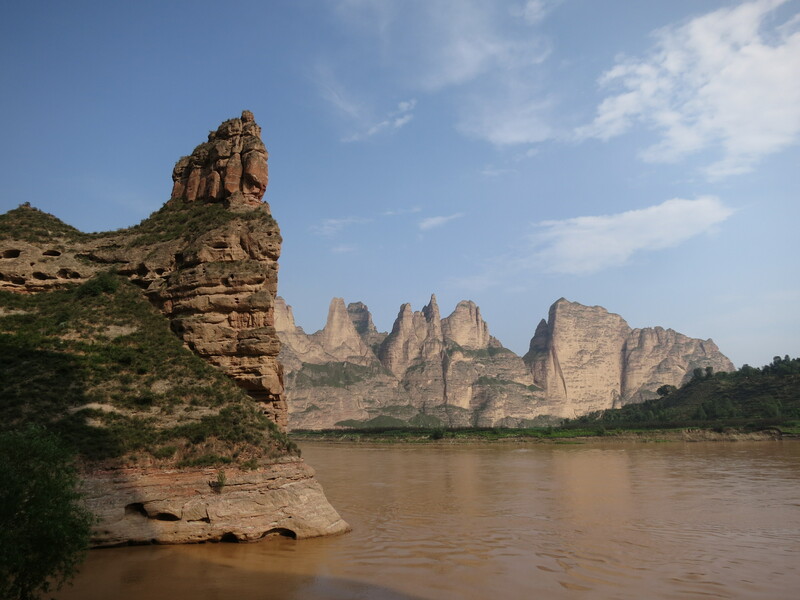 In the afternoon, while waiting for our relatives we walked along the Yangtze river, crossing two bridges and did about 8km in less than two hours, but to our chagrin there was nothing much to see in the riverside where we walked. Lanzhou is a rather big city, one of the central cities in northwest China, and it definitely has that big city feel to it. After a great meal (the restaurant owner sold enough lamb stews to become a real estate developer…..w t f), we were taken to a “slow rock” 慢摇 bar. Don’t let the name fool you, here in Lanzhou, slow rock is probably the equivalent of a downtown club, with bright lights and loooudddd hiphop blasting through the audio. This place was one of the hottest bars in Lanzhou, and it had live performers doing some pretty good party songs, with a guy wearing shades yelling “PUT YOUR HANDS IN THE AIR” and other standard party anthems like… dance versions of Spice Girls, White Stripes, and some really good Chinese party hip hop. The highlight of my evening was the DJ spinning some remixed Skrillex…… ahhhh, nothing beats some wubwubwub dubstep after multiple beers in a foreign city. Oh, and the girls were rather attractive, but definitely not to me and my hiking shorts and Arcteryx tshirt. Waking up at 6am to watch the sunrise over the desert and a nice breakfast with Nescafe, we rode our camels back into town. We headed over to the hostel where we stayed the previous night and walked in to use their showers. Hostels are great, no matter what you do it is never out of the ordinary. So we just spent the afternoon chilling in the lounge area of the hostel. The British chap that we camped with the night before was actually in the same hostel, and we chatted up a bit. He also plays guitar quite well! O well, everything was good and we rested up early. The old city of Dunhuang is actually really small, so following our guidebook we walked over to the Dunhuang History Museum, but apparently our book is 3years outdated! So instead of walking anymore in the desert sun, we succumbed and hailed a taxi to the new museum. The museum is new, with interesting architecture and had a lot of information about the city’s rich history. Being a centre of trade and people, it is really an oasis in the desert, both figuratively and literally, it is surrounded by desert!!!!!! Another morning, another round of beef noodles, and we’re on our way to Dunhuang, another city along the old silk route. Over the 500+km drive, the desert landscape took hold and it felt like I was going nowhere! Seriously, how did people manage to walk across such long journeys to trade silk? And that’s just like an insignificant of the trip from Mediterranean/Europe?!?!? Now, even 1.5km is barely walking distance!!! Crazy. Dunhuang, although it is surrounded by desert terrain, is actually a very nice little town with a lot of things catering to tourists! We found numerous coffee shops (this is China, coffee is a luxury good) with free wifi, comfy sofas, cozy decor and parked ourselves there for a couple hours and relaxing to the music and caffeine. Then we headed out and sat down in one of the street market vendors selling BBQ chicken wings and lamb skewers! While eating dinner, we overheard a very strange but familiar sound… ENGLISH! We met this Korean guy that was traveling alone throughout the northwest of China, so we shared some stories and chatted up a bit! So tomorrow we’ll start actually start seeing some of the sights around the city, stick around! You eat yogurt with a straw!